This post will show how to insert Super Column to Cassandra by using Thrift API. 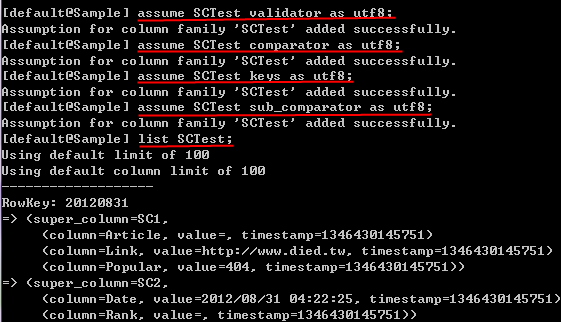 At first, we create a Keyspace named "Sample" and Column Family named "SCTest" via Cassandra-cli. As default , column type was "Standard" , so we need to assign column type to "Super". then , we using Thrift to insert Super Column to DB , here is the sample code. Following code almost same as Thrift Examples, I only change some place to insert super column. In the example , I add one column (Key:datetime) with 2 super column , both super column contain different columns. After insert data success , we can use "List" command to show data in the column family. You can see the record added , but it's unreadable . That because Cassandra column default was save as "Byte" , so after convert , the value that we insert was hard to read by human. We can use "assume" command to make the value readable , after that , you can see the data that we insert was correct , congratulations ! !